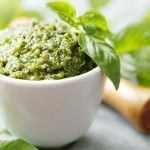 Fresh basil pesto just screams Summer in our house. And if your garden is like ours, just a few plants keep you busy harvesting. So, enjoy this very simple condiment of basil pesto over pasta – top it with grilled shrimp for an easy evening meal. And, I highly recommend freezing a batch to use later in the year. I know you can buy pesto just about anywhere, but really, fresh is easy and tastes wonderful. 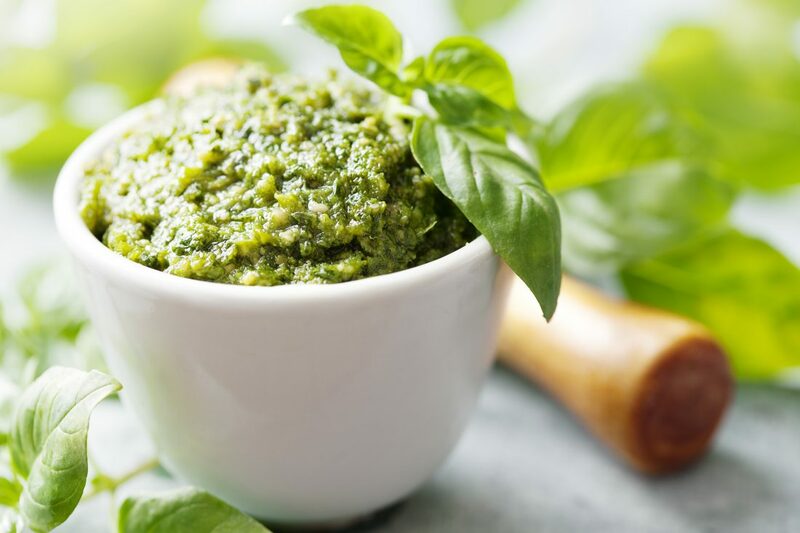 Every bite of fresh basil pesto reminds you of Summer! Enjoy this any way you like - over fresh angel hair pasta, top a piece of grilled salmon, toss with tomatoes and cucumbers or spread on a toasted baguette. Enjoy. 1/3 cup pine nuts - or substitute walnuts or pistachios! In a food processor, pulse the basil leaves and pine nuts until roughly chopped. Add the garlic and cheese and pulse until well mixed - stopping to scrape down the sides. With the lid on, slowly drizzle the olive in while the processor is continually chopping. Add fresh ground pepper and sea salt to taste. If you are storing the pesto to use later - top it with a drizzle of olive oil to retain the vibrant green color. 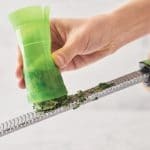 You can freeze it in a glass jar for several months - some like to freeze in mini ice cube trays as well. OR - try freezing in our Heb Stick. Stir it into a fritata for a great brunch dish. Serve with pasta and simply add a bit of Parmesan or Romano cheese. Add to any baked/broiled or grilled fish while it rests. Add to roasted vegetables after they have roasted. Stir into sauces or soups. Top sliced broiled tomatoes with a dollop.